What do you eat for lunch during the week? When I was working, I lined up Riley, Talia and my lunch boxes and packed them full of healthy options. The girls' lunches are still filled with a variety of satisfying, healthy treats but mine is pretty much non-existant! I never went back to work after Lola was born and since then I have been very inconsistent about feeding myself healthy lunches! I seem to have breakfast and dinner down but lunch either gets skipped or I find myself foraging, eating the remnants of Talia's soup or the crusts of Lola's peanut butter and jelly sandwich. I'm not big on resolutions but this is something I would like to be more consistent about in 2013. Soup is always a great lunch option for me (and the kids). I make it over the weekend and we eat it for several days during the week. It's quick to reheat in between preschool pick up and the arrival of Talia's afternoon kindergarten bus! Escarole and bean soup is on the menu this week! Prep Ahead Plan: I made this soup on Sunday and as the week goes on, the flavors marry and taste even more wonderful. Soup only gets better with time! 1. Heat olive oil in a large soup pot. Add garlic and crushed red pepper and saute for about 1 minute. 2. Add escarole and saute for a few minutes until the leaves get wilty (if that's a word). 3. Add broth and beans and bring to a boil. Simmer until the leaves are tender enough for your taste! 4. Serve with a sprinkling parmesan cheese (optional). 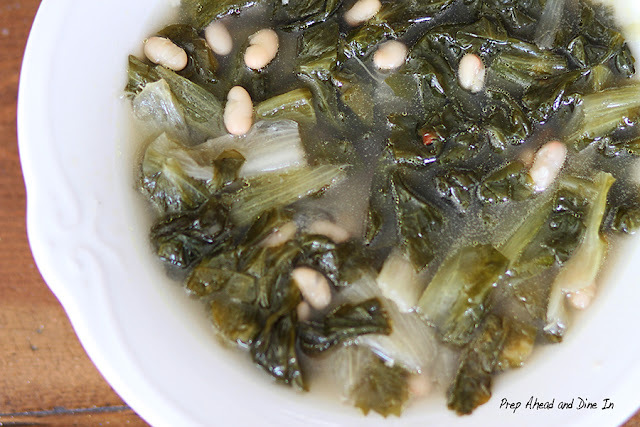 Copyright © PrepAhead and Dine In: Escarole and Bean Soup..lunch for Mommy. All Rights Reserved.